For a lot of board gamers out there, we’ve got shelves full of games that we’ve picked up at places like Target or Barnes & Noble – each representing a different play style and different mechanics. The question is: where do you go next? If you like Game A, then what other game should you get to build upon that? In a previous article, we introduced the concept of “Board game step ladders”. The list that we present here begins with a game that’s pretty standard and fairly easy to find. Then, we follow that up with other games that take the concepts and core mechanics the first game presents and then build upon or improve them. As you climb the ladder, the games become more involved and more challenging. You can find a complete list of our board game step ladders. In today’s Step Ladder, the theme is mancala. Each of the following games features the concept of picking up things and dropping off things with varying levels of complexity. The board is laid horizontally between the two players such that each player has their own row in front of them. Each of the pits is pre-loaded with four stones with the stores being left empty. 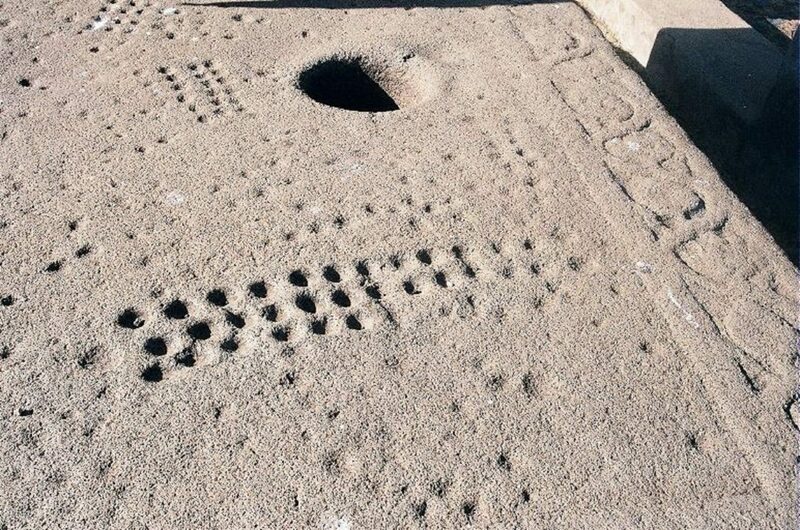 On a player’s turn, they will pick up all of the stones from any of the pits on their side of the board and then begin moving counterclockwise around the board depositing a stone into each pit that they pass along the way. Should a player pass over their own store (the store to their right) they will deposit a stone into it. Should they pass over their opponent’s, then no stone is deposited. If the last stone in a player’s hand is deposited into their own store, then they get to take another turn. Play continues in this way until either side of the board is empty. Then the players count up the stones in their stores and the person who has collected the most wins the game. All in all, it’s a fairly simplistic game and that’s probably a large part of the reason for its widespread popularity. The next game on this list takes these simple concepts and elevates them by tying them to specific actions. 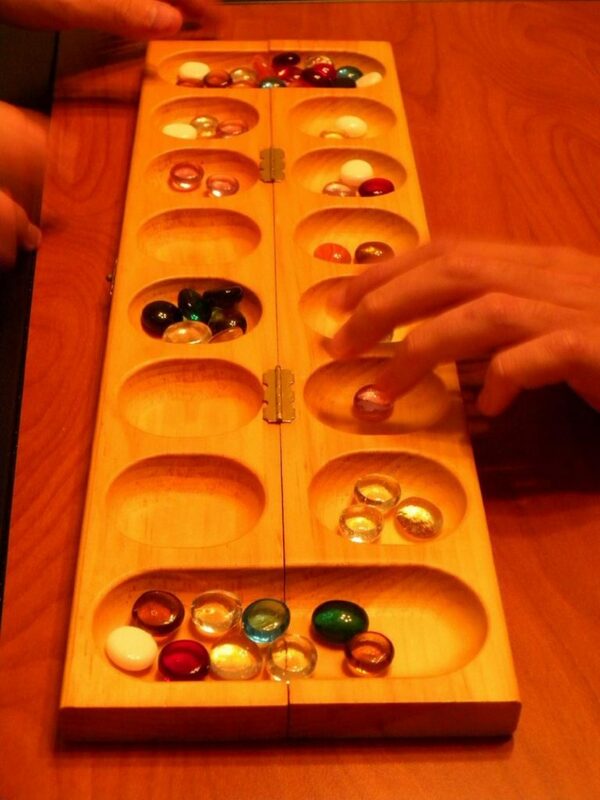 Here’s an interesting factoid for you: the word “mancala” is derived from the Arabic word “naqala” which means, roughly, “to move, to convey, or to transfer”. So it is, having heard this, that the full name of this game – Five Tribes: the Djinns of Naqala – takes on a whole new meaning. At its heart, Five Tribes is a game about picking up things and dropping off things, but there’s so much more to it. The game of Five Tribes is played on a 5 x 6 grid of square tiles. Each tile features a number, a specific color (either red or blue), and a specific ability. The number represents the tile’s victory point value. The color is largely unimportant. The tile’s ability, however, is of tantamount importance as we will soon see. The game also comes with a bag full of meeples in five different colors (red, green, yellow, white, and blue), a deck of goods which represent different types of goods, and a deck of djinn cards. Each djinn has a victory point value associated with it and each djinn also has a special ability that it can perform. 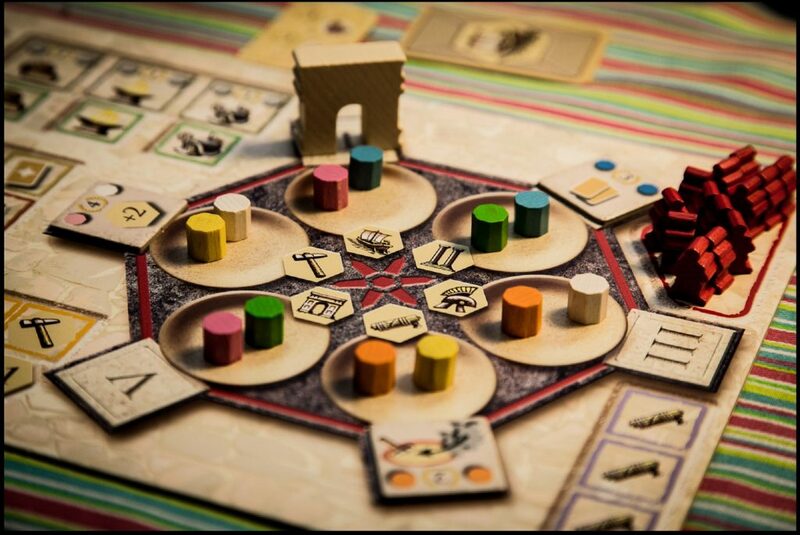 At the beginning of the game, the play area is seeded with the different colored meeples (three meeples per tile), goods cards are drawn from the deck to form the market, and three Djinns are flipped up. Each player begins the game with 50 gold. The players will spend money each round to bid for turn order and then, during their turn, they will take all of the meeples from any single tile into their hand and then move to a different tile leaving one meeple behind on each tile between the original tile and the target tile. When they complete their movement, the last meeple in their hand is placed onto the target tile and then all of the meeples on that tile that match the color that was just placed there are removed and things happen. Each meeple color has an ability associated with it. That ability fires off when the meeple is picked up. For instance, the green meeples allow the players to take cards from the market and add them to their collection. Once the meeple ability has been used, the tile’s ability may be used as well. For instance, some tiles allow the players to buy cards from the market, some award gold, some allow the players to purchase Djinns. 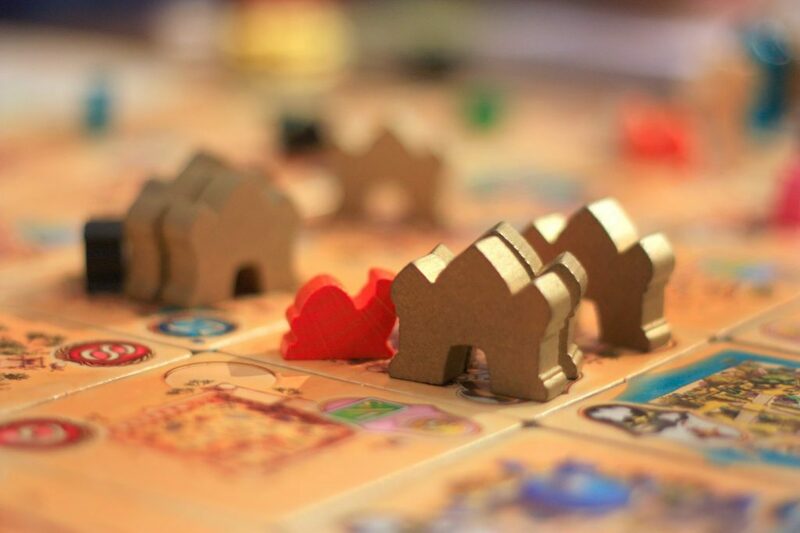 After the tile ability has been used, if the tile is empty of all meeples, the player can place one of their camels on the tile which will earn them points at the end of the game. The game continues in this fashion until one player has run out of camels or there are no more legal moves on the board and then scoring is performed. Players can earn points from a large variety of things – gold earned, resource cards collected, points from Djinns, etc. The person with the highest score wins the game. This may all sound very confusing, but it really isn’t. After a round or two, you’ll have the hang of it and the underlying strategies will begin to emerge. Aside from the mechanics that I touched on above, the one element about this game that is not immediately obvious is that everything you do in this game has an indirect effect on your opponents. If you’re not careful, the meeples that you move could effectively set up one of your opponents for a very large scoring move. While Mancala also has some indirect player interaction of a sort, it is not nearly as important to consider as it is in Five Tribes. It is because of this as well as the introduction of point scoring that makes Five Tribes a good step up the ladder. 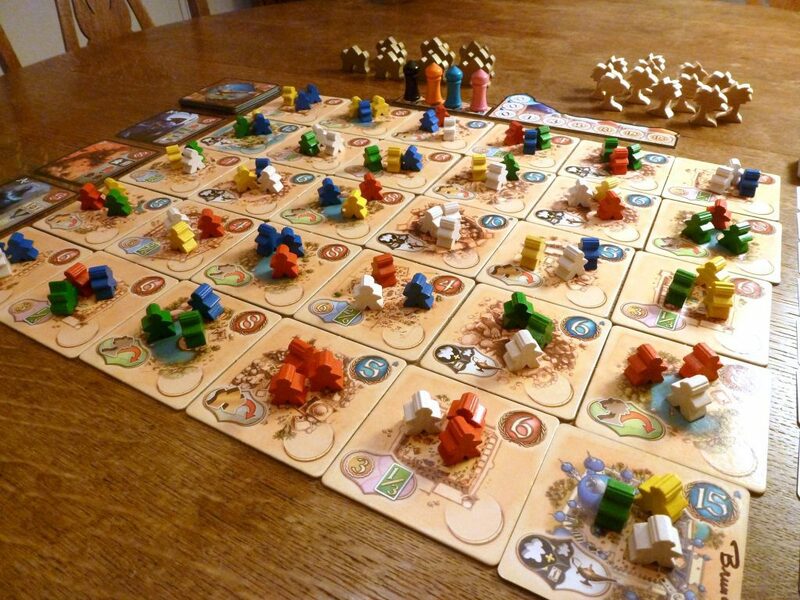 If you’re interested in learning more, then I suggest you check out our Five Tribes review. Like Five Tribes, Trajan also associates the mancala mechanic with specific actions, but it has extra elements added to it that take the game to a whole other level. In between the players is a central game board with different locations that help the players score points in various ways. Each player has their own player board with six action circles printed on it. At the beginning of the game, the players receive 12 octagonal action markers (2 each of 6 different colors) that they divvy up evenly between these action circles. On their turn, the players will pick up all of the markers from one action circle and move them clockwise around the board to a different action circle making sure to drop off one action marker into each action circle that is passed over along the way and then, depending on what they moved, how much they moved, where they moved to, and what’s waiting for them at that location, things will happen. The game is played over several rounds and these rounds are governed by a built-in game clock. The more markers a player moves at a time, the faster the clock runs down. The fewer they move, the slower the clock moves. At each location on the action circle, there is the possibility that a Trajan tile will be waiting there. If the right assortment of colors is present, the player can utilize that tile to perform its special action (i.e. – adding workers to various spaces on the game board, scoring victory points outright, or drawing cards from the resource deck). There are six game board locations, each with their own associated actions. The action circle that the player lands on is associated with one of the specific locations on the game board and landing there is how a player would perform any of the actions that are associated with that game board location. These different locations provide the players with a multitude of different ways to interact with the game in order to score the points that they will need to win. For instance, when landing on the military action circle, the player may deploy workers to the military camp OR move their leader around the provinces of the military area of the game board OR deploy workers from the military camp to the provinces to score points and earn rewards. This is, of course, an oversimplification of the rules for the game. To an outsider that has not played the game yet, it can seem pretty intimidating. There are many varied paths to victory and it’s never clear just what the best move is. Trajan is a game all about efficiency and scoring points. I deliberated placing Trajan on the second rung of my ladder because I felt that the player interaction in Five Tribes was a distinguishing element that added a whole lot of depth to the experience. While there’s not as much player interaction in Trajan as there is with Five Tribes, I decided that Trajan belonged at the top of this ladder due to its size, scope, and complexity. For instance, not only are you trying to maximize your turn to score as many points as possible, but you’re also tasked with having to consider the game clock while doing all of this. If you’re in a good position, you might want to run the clock out by moving a massive amount of markers at the same time or you might want to try to drag the game out just a little bit longer to squeeze out a few more points. Like I said, there are always a lot of decisions to make. Trajan is an amazing game and it stands as a shining example of the mancala mechanic elevated to its very best. Give it a try and I’m certain you will agree. You missed Gold West! Its a gem of a game, lighter and inspired by Trajan. Good call. Gold West is a really solid game. I’m a fan of just about anything designed by J. Alex Kevern.